This week is all about getting energized! I admit, a few weeks ago I was in a really weird funk...like I couldn't seem to focus or get things done the way I needed to. I was lacking motivation and feeling a kind of blue & stagnate, but it's amazing what a little bit of sunshine & some great friends can do for me! Spring is finally really in full bloom in Portland - the sun is shining, the flowers are in bloom, the farmers markets are filling with beautiful fresh produce, and the city is coming out of hibernation and coming back to life. I absolutely love this time of year. It fills me with a lot of energy and excitement & it seems to have kicked my funk! The past few weeks have been full of amazing times with friends out in the sunshine and we are making plans for all of our summertime adventures & looking forward with hopeful anticipation. It reminds me a lot of why I moved to Portland in the first place with all of it's limitless potential. 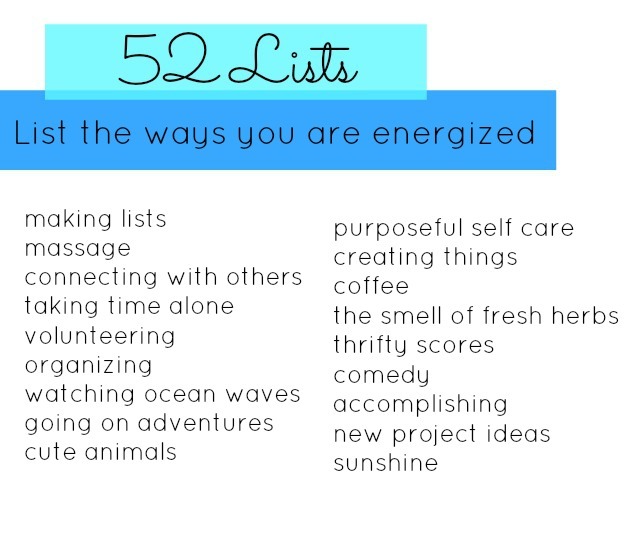 Here are a few things that energize me and keep me feeling this way! What energizes you? What do you do when you are in a funk to get yourself out of it? Hi! I'm Sarah from Exploring Woods. :) Just popping over from The Perfect Pear's blog party! What a fun idea; glad to have found you! Great list too! I could spend all day reading your blog. So excited I found you!! I just started Moorea's list project. I so agree with 'accomplishing'...good one!! !